Ekstrom and Hultmark (2016) recently developed the Munin system for detecting viral infections in Drosophila. The system consists of GAL4 tethered to the cell membrane via a linker carrying a cleavage site recognized by a specific viral protease. 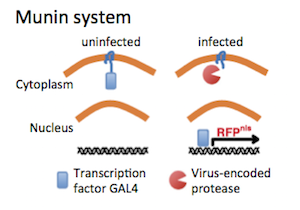 In the presence of virus, GAL4 is liberated from the membrane and can activate transcription from a UAS-driven reporter.